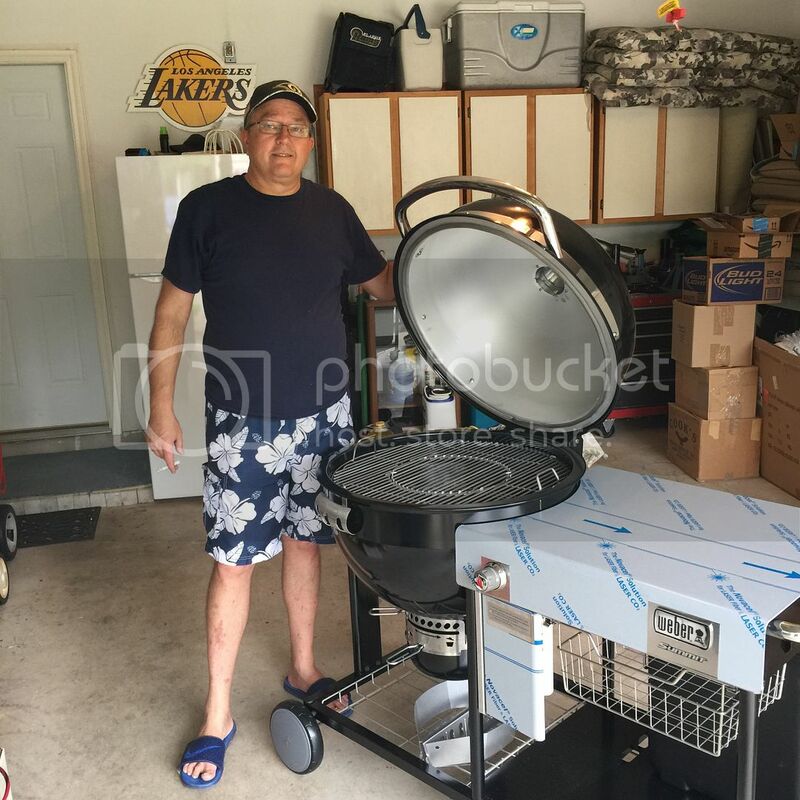 Review: Weber Summit Charcoal Grill, a short novel - Purchase and Assembly thoughts and my first cook (Lots of PRON) - The BBQ BRETHREN FORUMS. So, I started this thread late last night. I got about six paragraphs in, had too many windows open, went to close those that I didn't need, and accidentally closed this one. Long day and long necks were involved. <sigh> This time, I am writing this up in Word, and I’ll cut and paste when done. I’ll apologize now for the novel. If you don’t want to read me ramble, just skip down to the PRON. The Lead Up: Ever since I flew the coop from the parent’s house, I’ve had some sort of charcoal grill, or at least, access to one. I enjoy the taste of the meats coming off the grill with that KBB and wood flavors much more than anything comes off a gasser. When I moved in with my now wife, she needed a gas grill with a side burner so that she could cook some her more pungent Korean dishes without smelling up the whole house. Backyard real estate said we really only had room for one grill, so I gave my kettle away to my best friend, and settled for what I had. I got pretty good at it, making some pretty decent food on the gasser, but it was just missing that extra flavoring from a coal and wood fire. When I got into smoking, this became even more evident, but there are just some foods that need to be grilled to me. 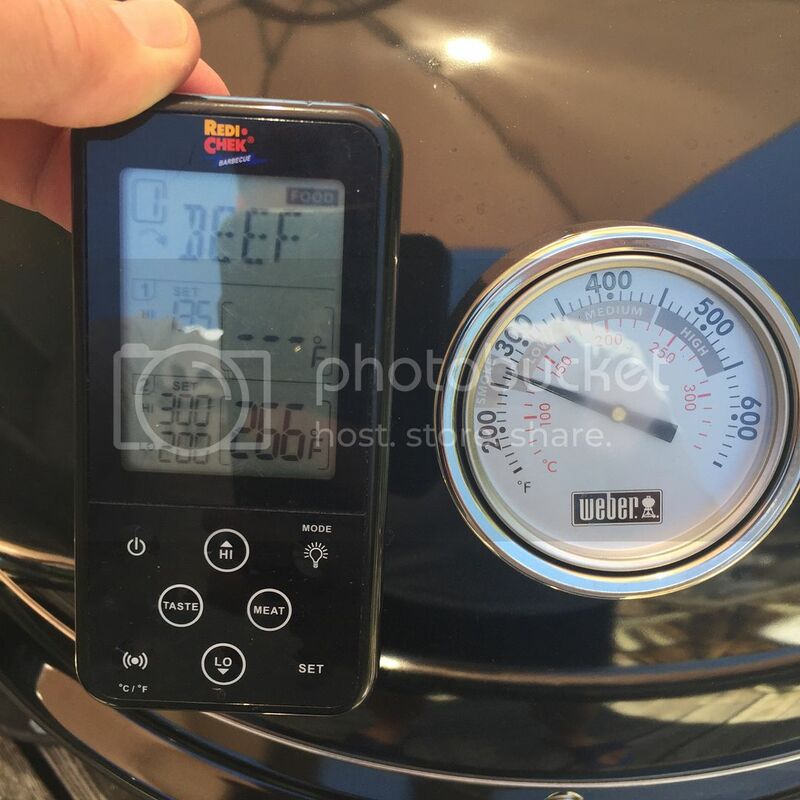 My current gasser, a Weber Genesis S-330 is a great grill, but the Texas weather was starting to take its toll on it. Most of what needs repair is under warranty, but my desire to go back to charcoal and wood led me to feel that now is as good of time as any to make the switch. The wife being away for a two month vacation also added to the opportunity. So, what grill to get? The Decision: First things first, I must admit that I am a Weber fan. 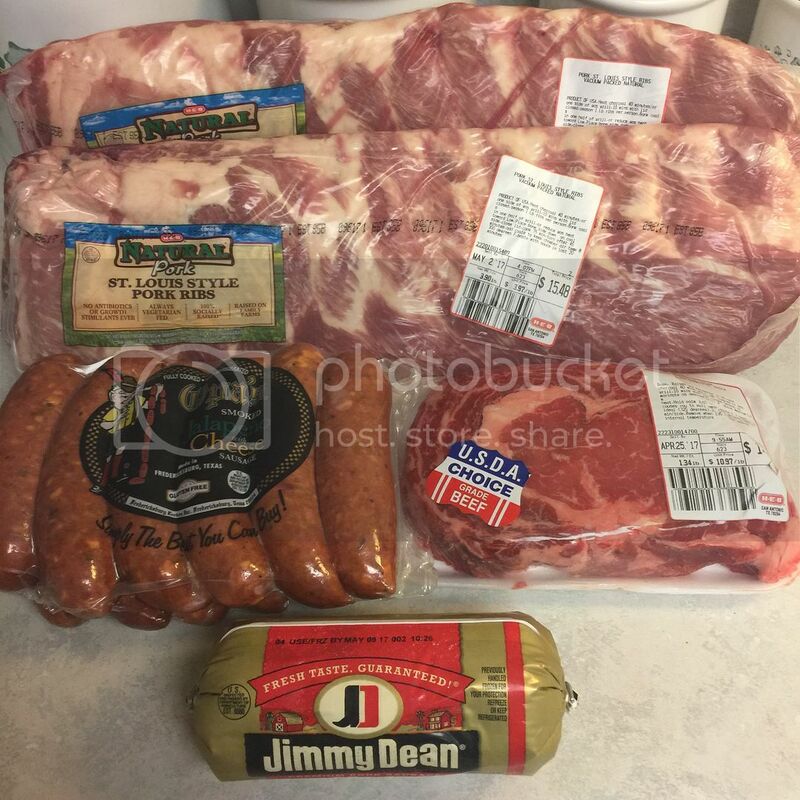 Some here on the forum suggested looking at other pits, and I did, but I kept coming back to Weber’s. I think it’s just the tradition of a Weber in the backyard. If I hadn’t outgrown the WSM, I’d still have it for my smoker. A typical grill cook for the two of us is a couple Ribeyes and various veggies in a grill pan and a basket. On the gasser, that pretty much filled it up. So, I needed a grill with at least the same amount of cooking area. That took the 22” kettle off the list and left the 26” and the Ranch. Since the gasser had the side tables that I was used to using, I wanted something with an attached table to set pans on, etc. Weber doesn’t make the either of those with a table, so I was looking for options. 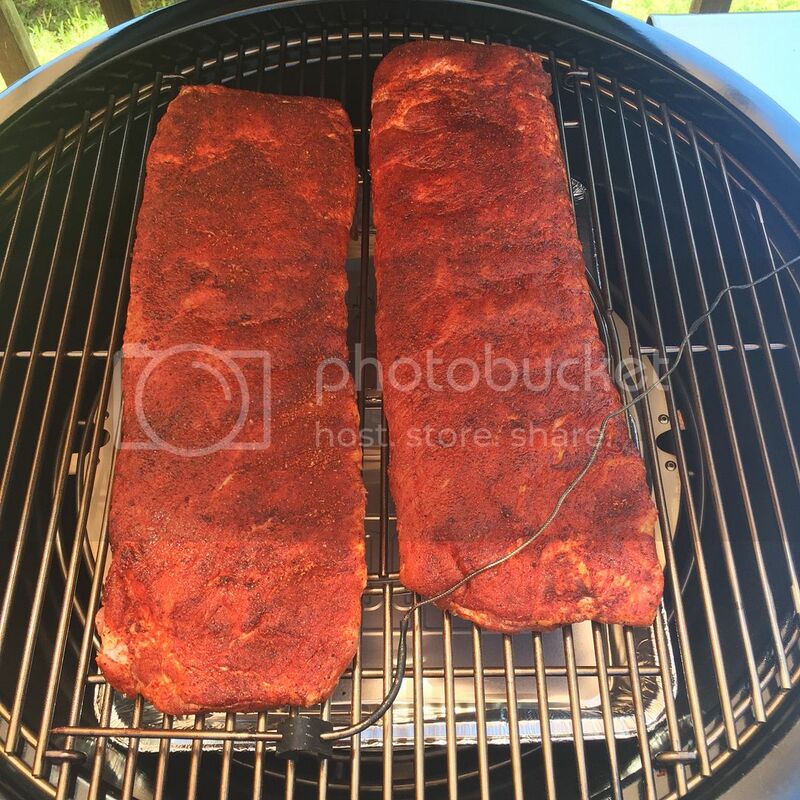 Along comes the Weber Summit Charcoal Grilling (WSCG) Center. On face value, this met most of my needs, but had two drawbacks. The first, and the one that everyone thinks of, is the price. And I’ll admit, Weber blew it here. Not necessarily on the price point, but in their advertising. What were they calling it? The Grill of a Lifetime or something like that? 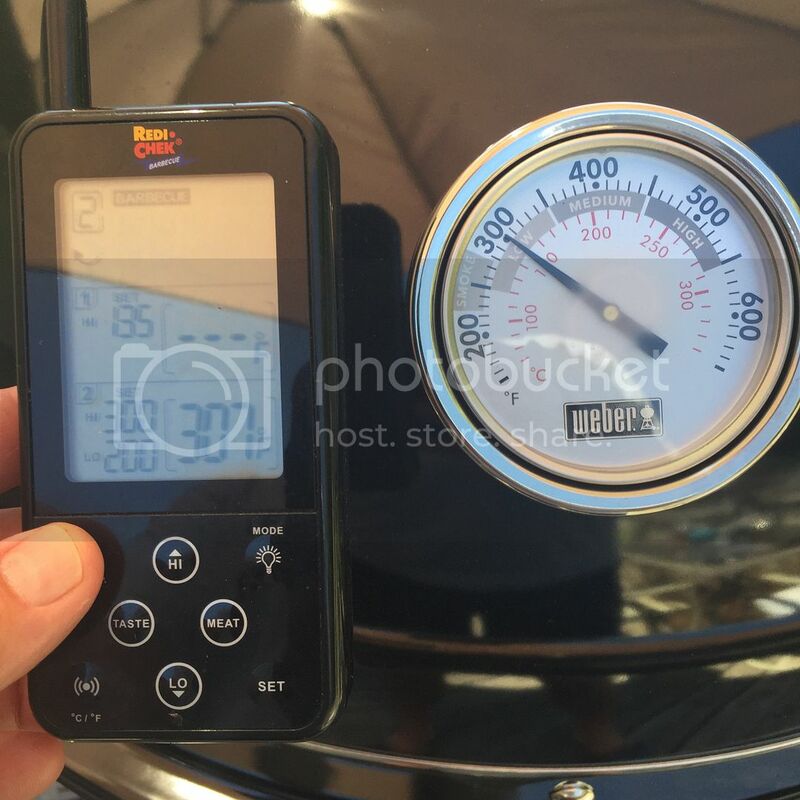 They came out saying it was a hybrid of the Weber kettle and the WSM, just at three times the price of owning both. 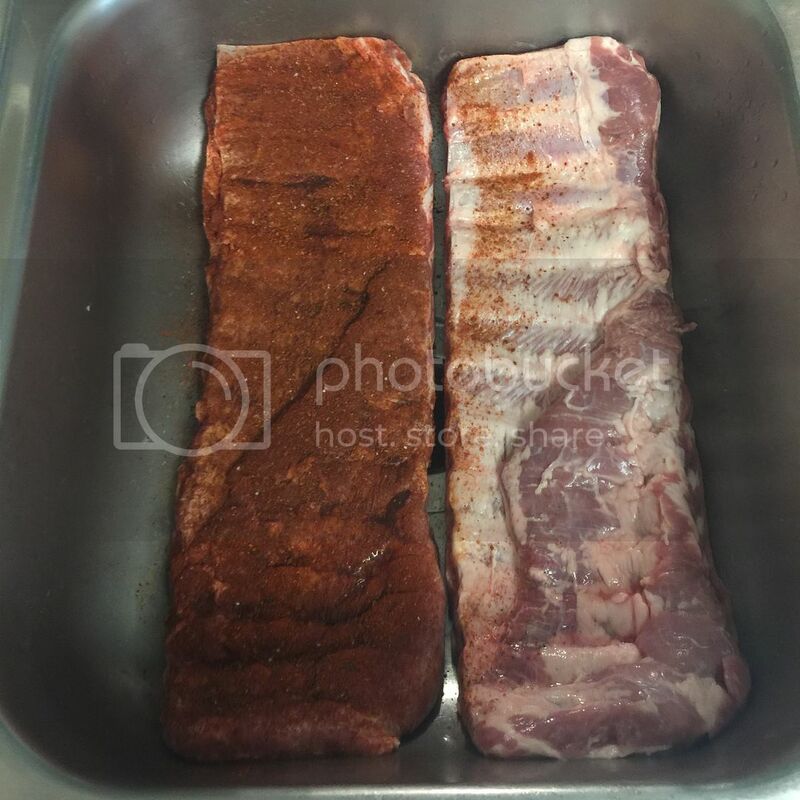 I think it was Justin (Babyback Maniac) that said they should have been comparing it to the BGE, because that is what is more similar two, and then the pricing is right on mark. All that is fine, but it was still a $2K grill / smoker. I am still not sure if it is worth that, but with a little care, it will last the rest of my grilling lifetime. My second issue was the available cooking space. At 452”, it’s slightly smaller than the S-330’s 507”. And it is round. Meaning that square cooking sheets or baskets leave awkward shapes of remaining space. 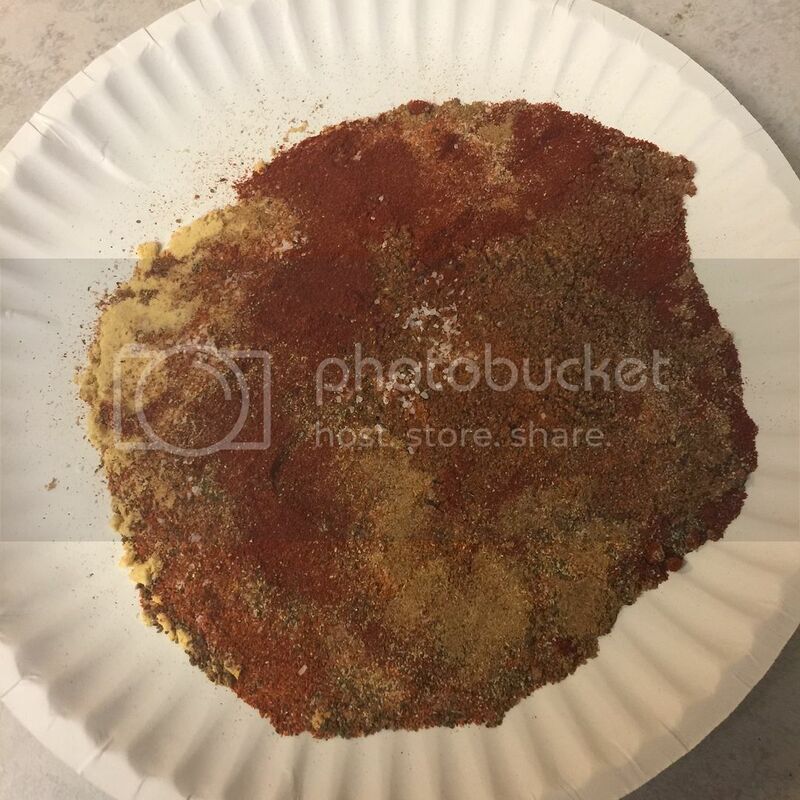 On one of my earlier visits to the only location in San Antonio that sells the WSCG, I was discussing with a guy about using cans or bricks and a second grate to add to the cooking surface. 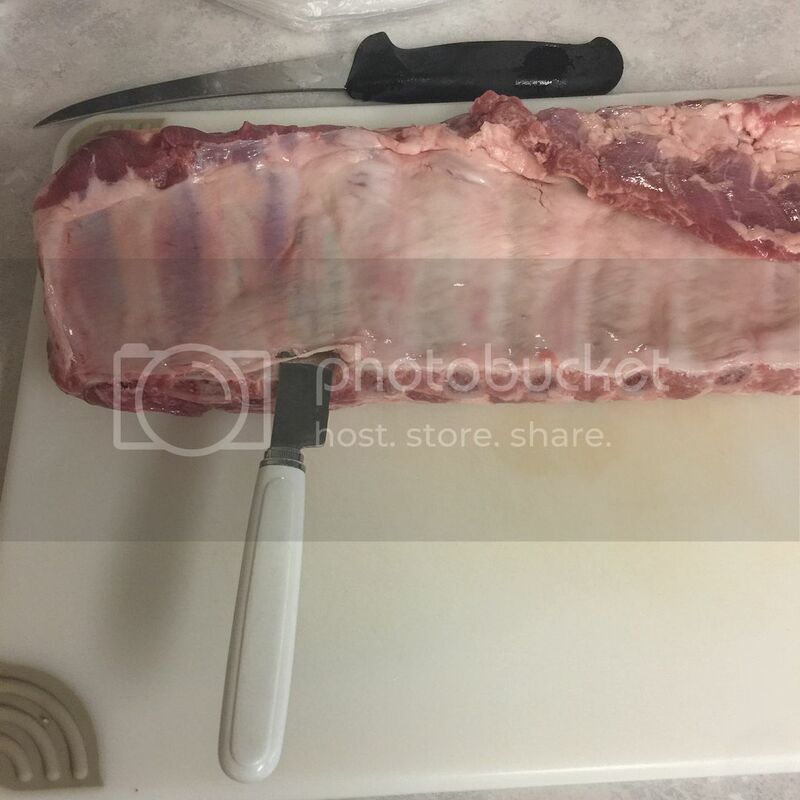 He said he had an idea and went to grab a large BGE Grill Grate Extender. The bracket fit like it was built for the WSCG. 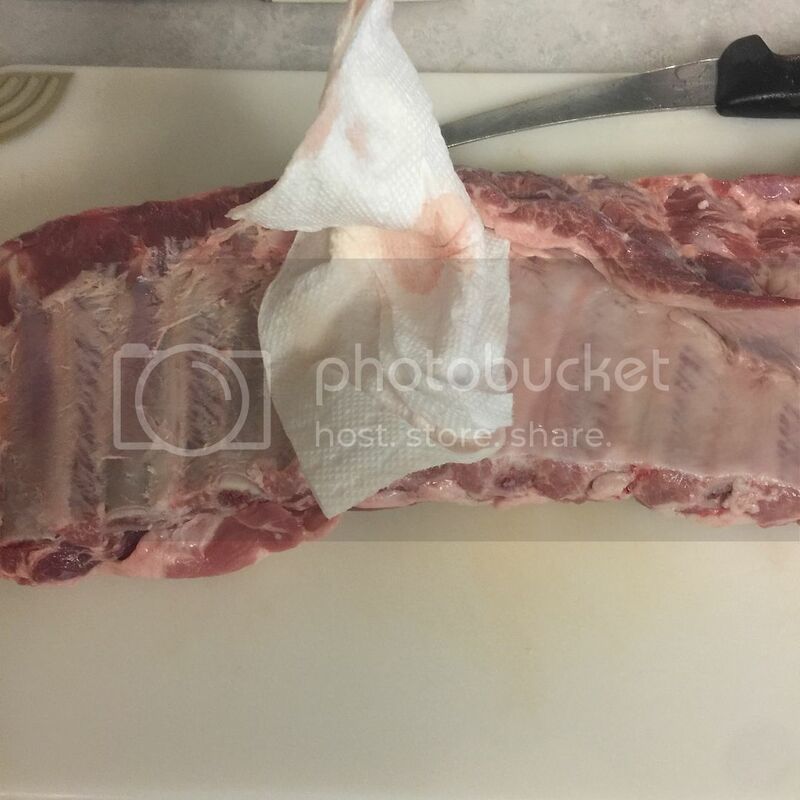 And, compared to Weber’s folding grate extender, this one had a larger cooking surface, and you could remove just the grate to get to the food underneath, not have to lift the whole thing out, flip your lower meat, and then try to fit the legs back in place. Of course when I went to buy it, they were out of stock, but they’ll have it this week and I’ll go pick one up. Oh Happy Day! 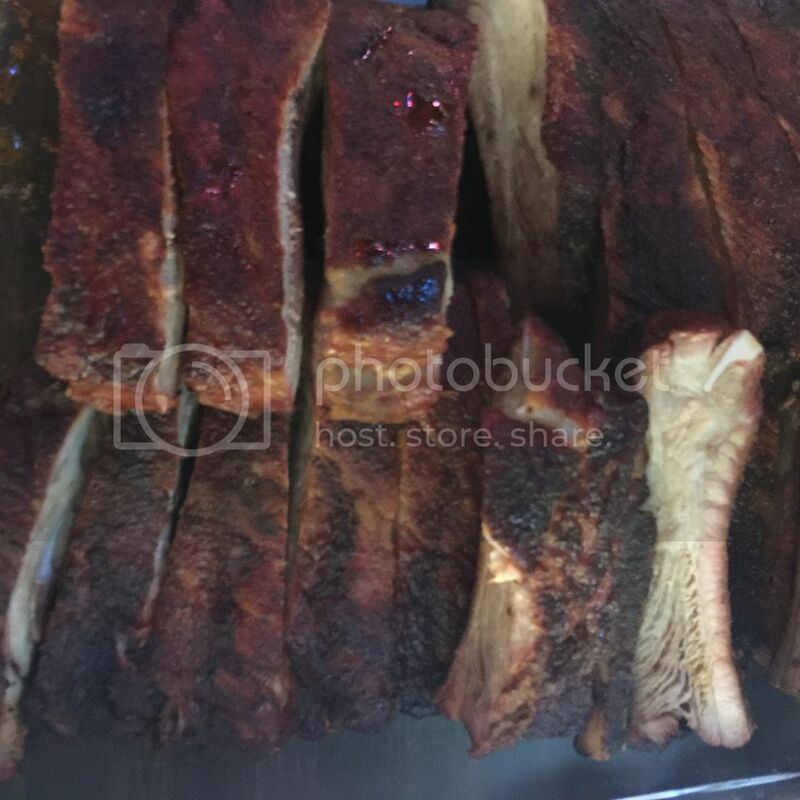 : I got up Saturday morning a little early and went to help a Brisket taco sale benefiting the Disabled American Veterans, just as a server, they already had the briskets donated. That was a lot of fun, and I think I got an “in” to maybe help them out in the future to perform the smoking on my cabinet. After that, it was time. Headed off to BBQ Outfitters and over to the WSCG section. They had the standard version on display, but had just refilled their stock of the Grilling Centers, and didn’t have one assembled yet. I was fine with that, thinking that by assembling it myself, it would save them time ($$$), and I might be able to talk them into some freebies. I was able to get the Military discount, an ash rake, and some grate tongs (I have since decided that having a second pair will be beneficial), but that was it. The covers are listed everywhere, but are all out of stock. I'll probably just order one to match the one on my LSG cabinet. What the hell. Take my money and load it up. Headed home and sent a text to my buddy to meet me at my house. We unloaded the 240 pounds worth of pallet, cardboard, foam, and well packed grill and spread everything out. I was surprised, the assembly directions were fairly straight forward, especially when I noticed that each step had a bubble at the top specifying which bolt to use. In less than an hour we had it all assembled and ready to take its place on my deck. I will say, this is a really nice, solid, piece of equipment. The only place that I think Weber cheaped out on is the rear wheels. It’s like you are at a stop light and this beautiful Corvette pulls up next to you. Man, it’s gorgeous. Sleek, Black, Chromed out, and then you notice the rear wheels have hubcaps. Not all four, the front two are nice rims, just the rear. What were they thinking? I may look into replacing those with something a little more fitting. First Cook: I woke up early on Sunday, well, for early for me. I had house cleaning to do, laundry, water the plants, etc. (It's a b!tch having to do all the chores) But more importantly, I had a fire to build. 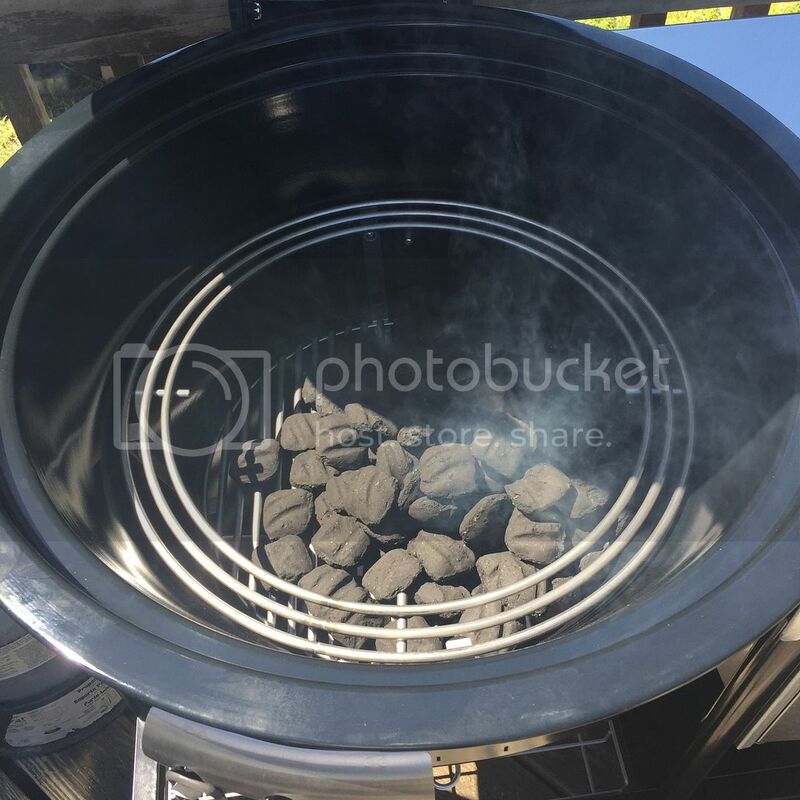 I filled up the charcoal bucket and put three "bowls" of charcoal onto the lower grate. I will say, that bowl idea needs work. 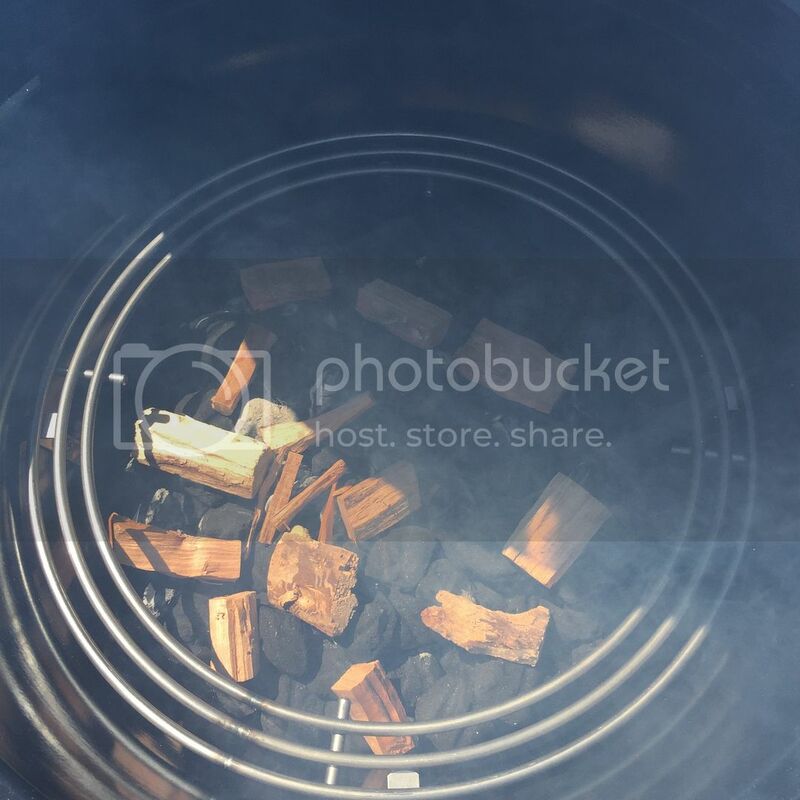 Not really easy to scoop charcoal with a plastic bowl. I turn the knob and WOOSH! We have fire. I set a timer for 7 minutes to get the coals started, then spread them out and added some small chunks of cherry. 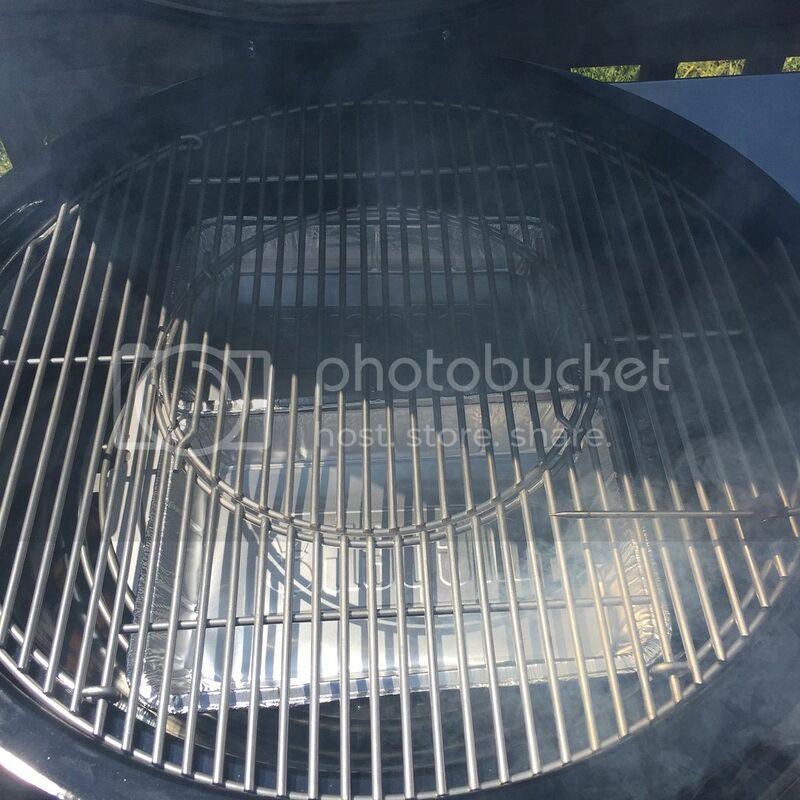 Put down the diffuser plate, some drip pans (next time I am going to use one large, single pan), and got the grate in place. 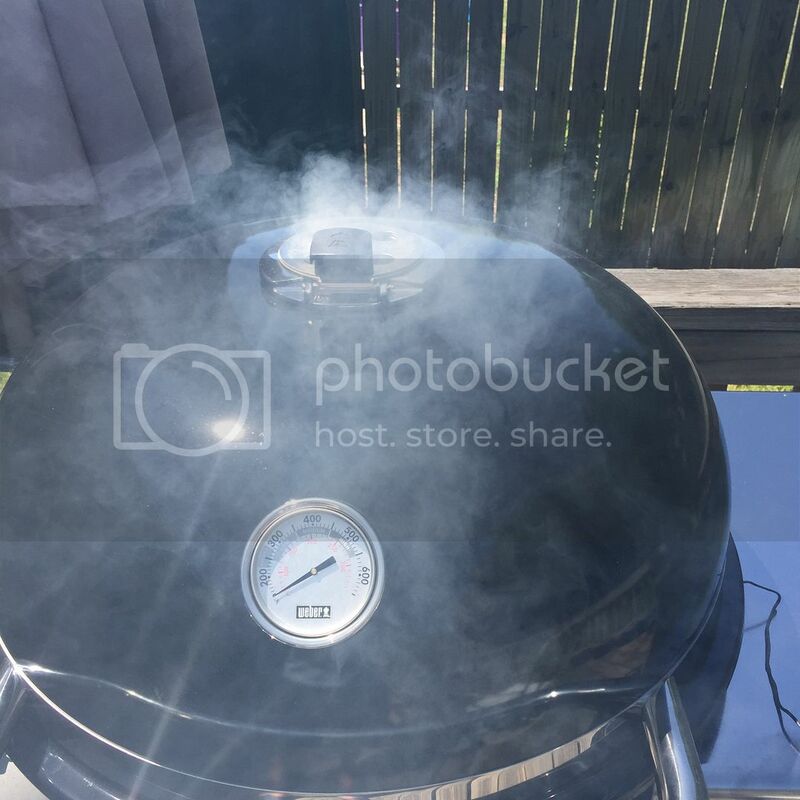 We have smoke! Not TBS yet, but it's a start. Starting to sweat, so they are ready. Even though I tried catching the temp on the way up, 300* was on the high end of what I was looking to smoke at, I preferred 275*. Made a couple of adjustments, and damn near put the fire out. A couple more adjustments to bring the fire back to life and get it closer to my target. After that, it was pretty smooth sailing. Time for the obligatory Nekkid Fatty. Last time I made one of these, it was very salty. 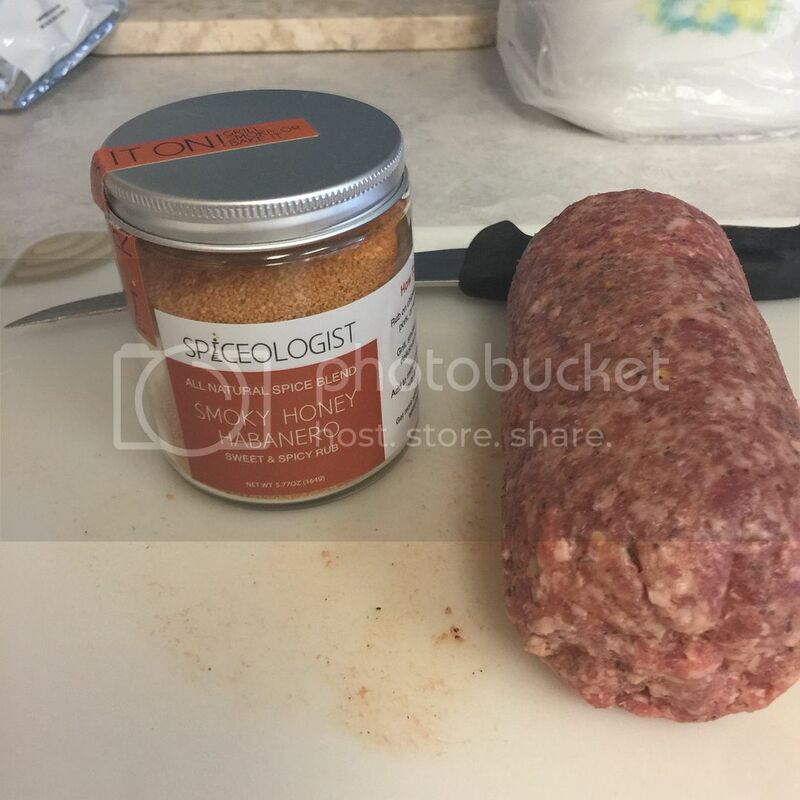 So, I dug through my collection and found a rub that listed salt as its last ingredient. Something my son gave me for Christmas that I figured I'd never use. Worked perfectly. 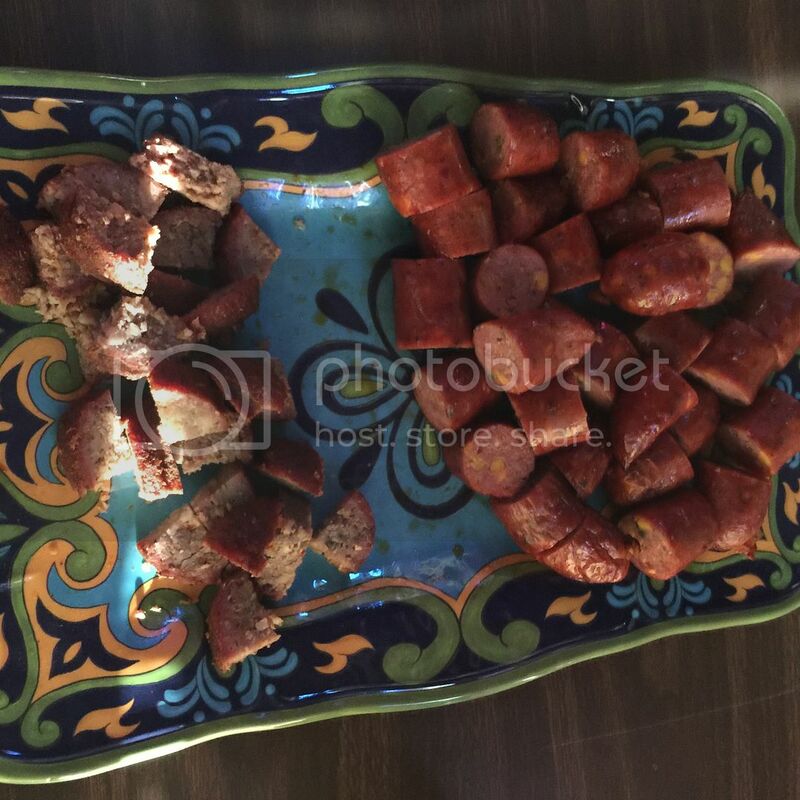 Last weeks sausage thread had me give Opa's a try again. 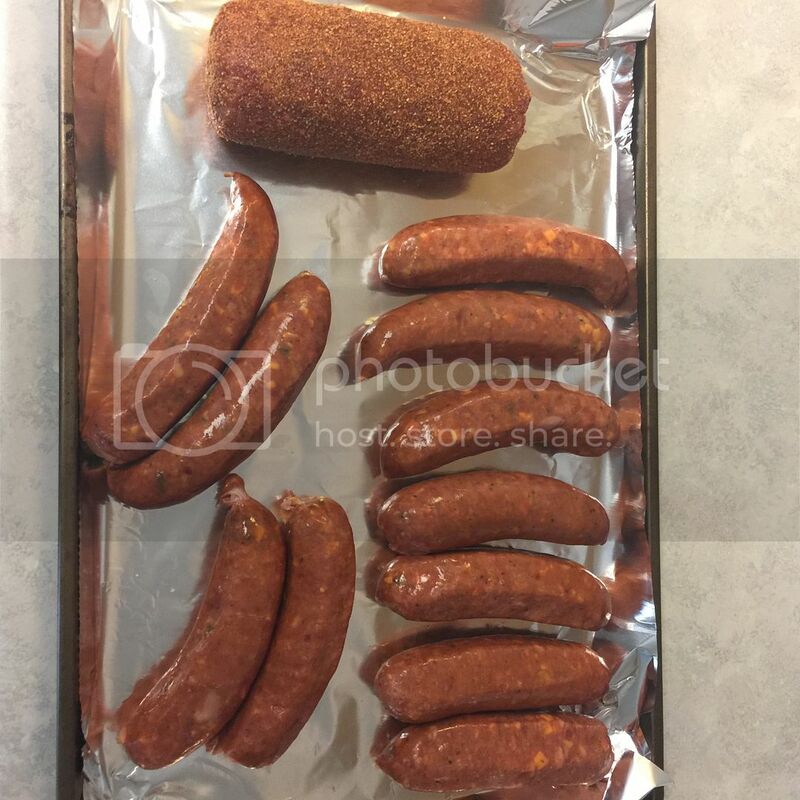 I got lots of compliments on these Jalapeno Cheese sausages. Might have to keep using them. 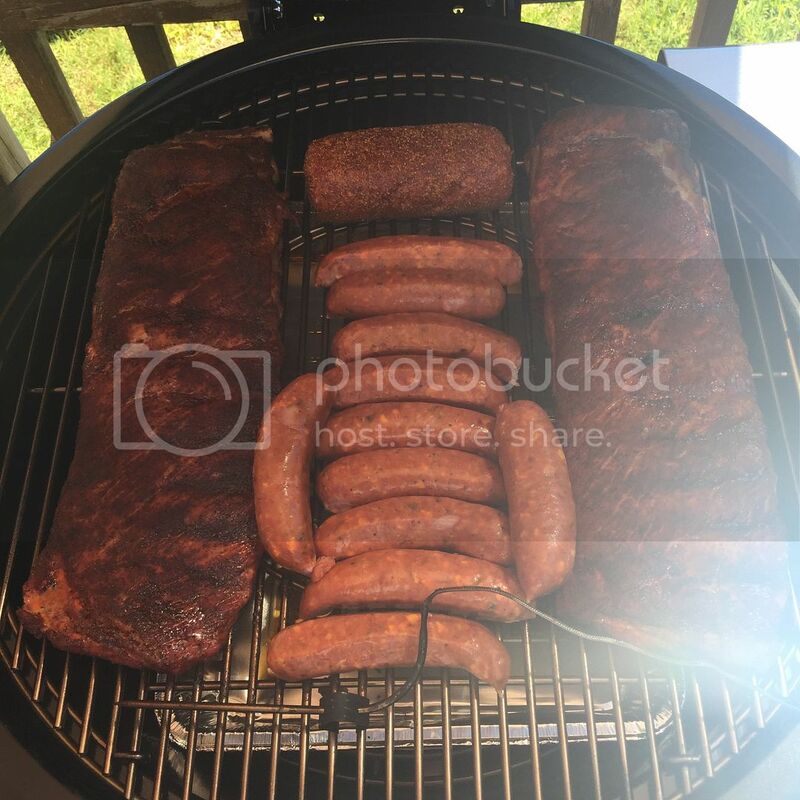 Two hours into the rib cook, I threw the Fatty and sausages on. An hour later, the sausages were up to temp. I pulled them off to a plate and put them in the microwave to stay warm. 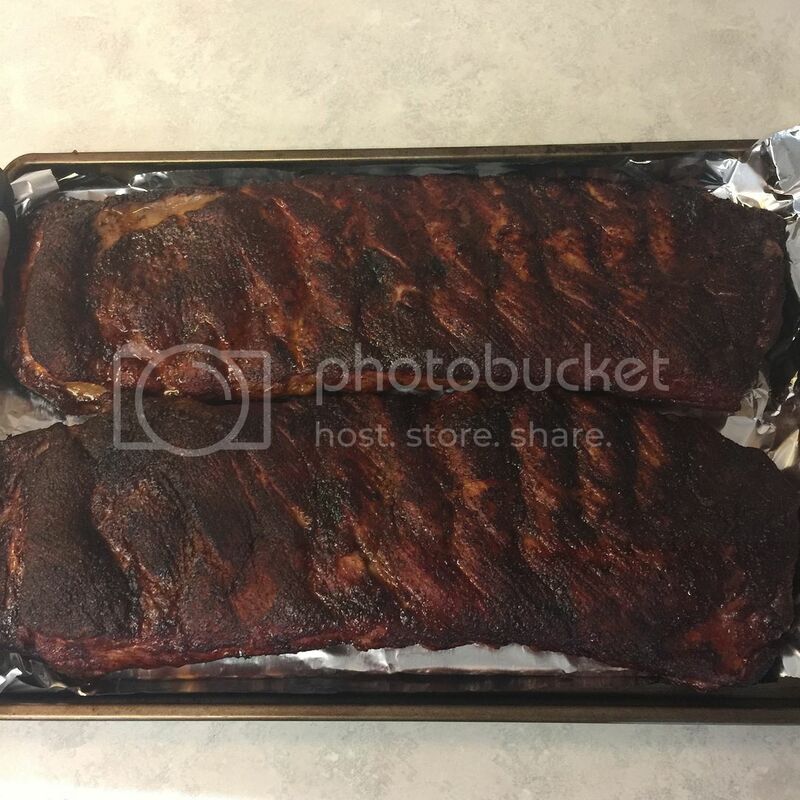 Thirty minutes after that, the ribs were done. Not as much drawback as I expected, but they easily passed the bend and toothpick test. The Fatty finished off about 20 mins after the ribs. From here out I was slicing and tasting, and forgot to take more pictures until we were at the bar and people were chowing down. Woops! 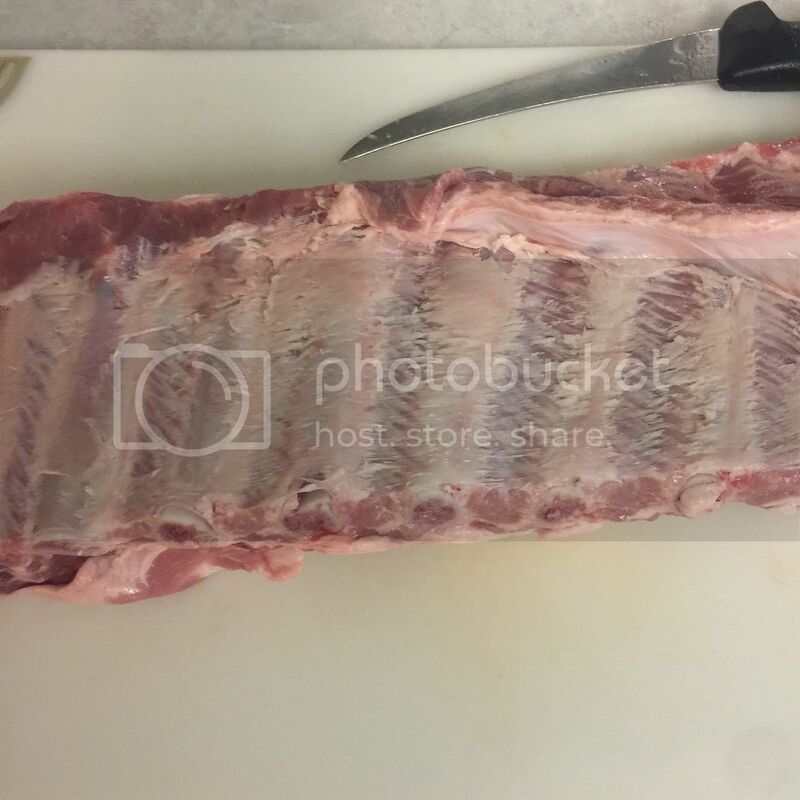 As is usual for me, I only got a little smoke ring on the ribs. But they were tender and delicious. Everyone loved the sausage and the Fatty. 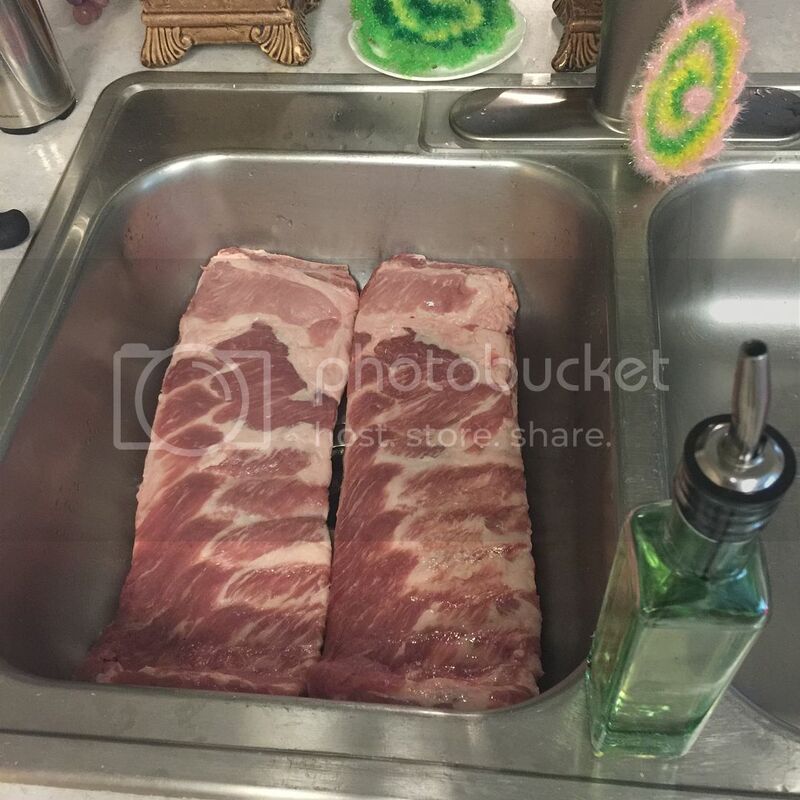 The Fatty actually got a little more ring than the ribs did. All in all, I am happy with my decision so far. That might change when the wife comes back. Thanks for looking, and again sorry I got so wordy. Last edited by THoey1963; 04-24-2017 at 02:01 PM.. Does anyone in Korea now about this yet? I am not sure. They took a flight to the Philippines to visit a cousin. She doesn't have access to her phone there. Not sure if anyone else has let her use a laptop to connect to Facebook. If not, she'll catch up next week. 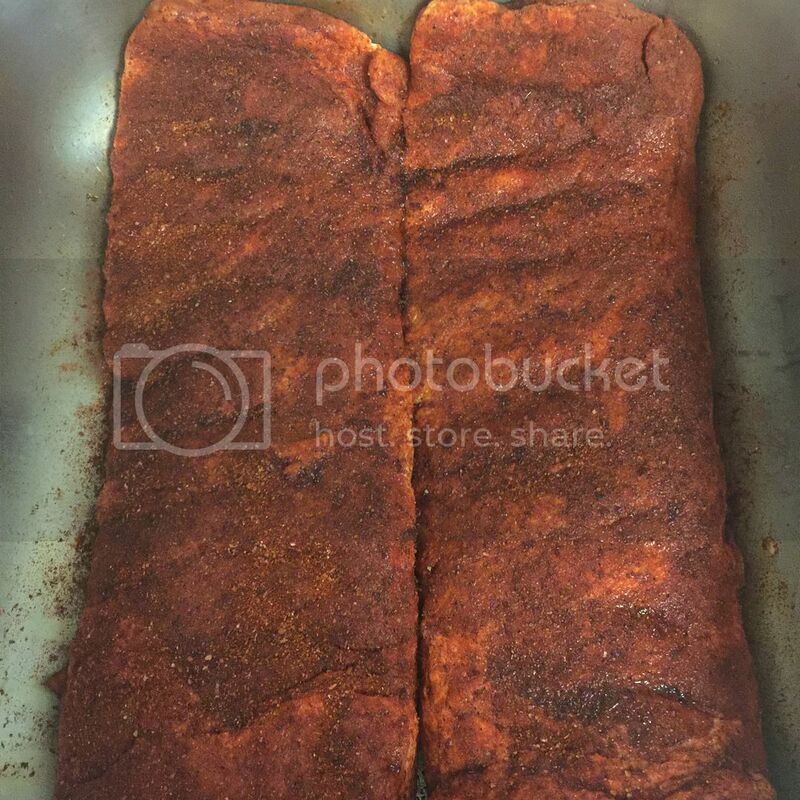 Whenever I cook briskets, it's usually at least two, if not more. Not sure if I'll ever cook one on her. Never know. 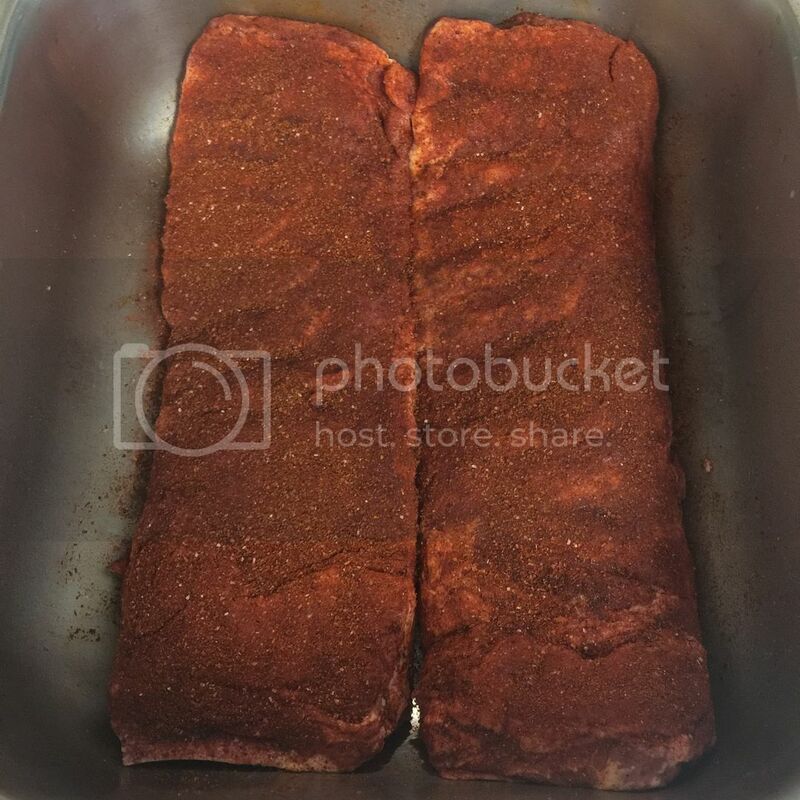 Great Post, Pics and Cook!!! 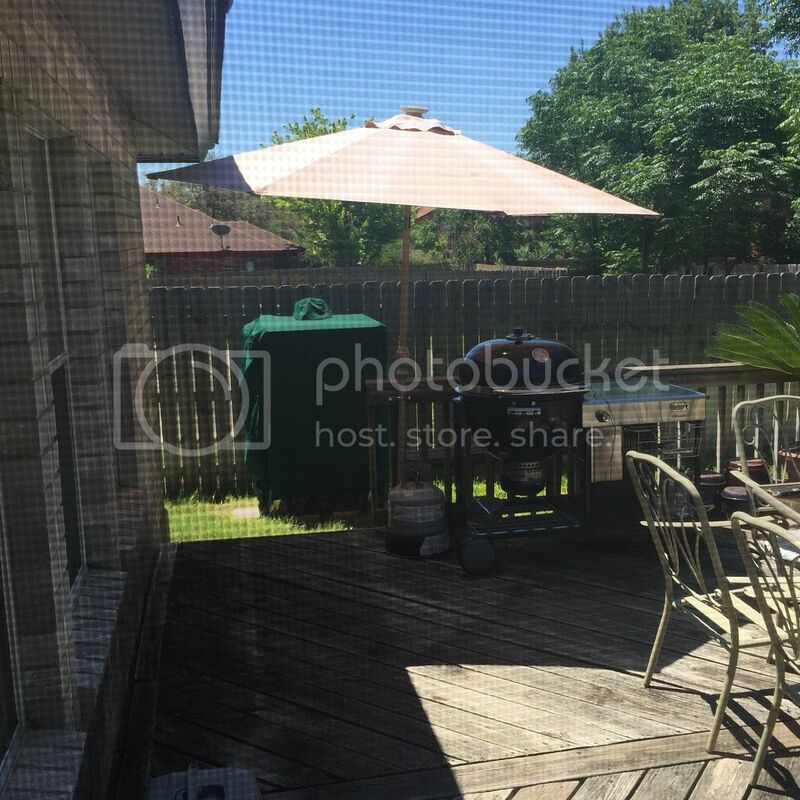 I like how you have that fence up right near your cooker to keep those Pesky Neighbors out who are automatically drawn by the smell of Que!!!!! Thanks for the detailed write up Thoey. I too am thinking about pulling the trigger on one. Congratulations and the food looks perfect! A Brethren in control of his scene. New cooker, quality meat- mad skills. Bride out of town making purchases that increase quality of life for yourself and significant other. Great post, food looks awesome too. 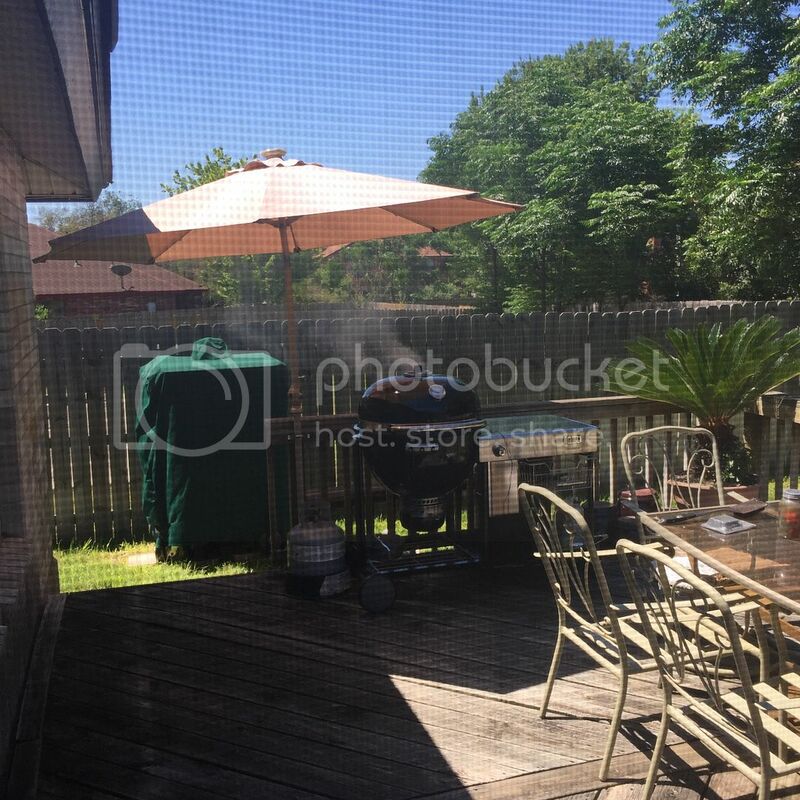 Congrats on the new smoker !